¶ 4 Leave a comment on paragraph 4 0 The post office’s influence on our daily lives has diminished and stamps do not serve the same cultural role they once did, because of the ubiquity of electronic communications. Fewer letters are mailed requiring fewer stamps, and more bills are paid online than through paper remittance. Most mail delivered to our boxes contains indicia and not colorful stamps. Even with this reduction in mail volume, the USPS prints nearly twenty-five commemorative stamps each year.2 Other than holiday-themed stamps affixed to holiday cards, most Americans no longer see stamp imagery of new commemoratives or definitive stamps on their mail, and they don’t read about new issues in their daily newspaper. Collectors and citizens interested in a specific subject might go out of their way to buy commemorative stamps, but stamps’ power to naturalize historical narratives has been greatly reduced by electronic communications. ¶ 5 Leave a comment on paragraph 5 0 Those narratives live on contemporary culture in federal and private institutions of public memory dedicated to interpreting postal operations, stamps, and mailable matter. The Smithsonian’s National Postal Museum in Washington, DC, for example, curates multiple galleries as a joint venture of the USPS and the Smithsonian Institution.In philatelic exhibitions, visitors are taught to read stamps as documents containing symbols and meaning within each design. 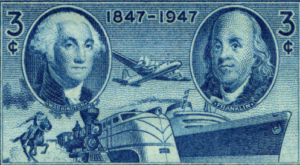 The reach of commemoratives and definitive stamps may not be the same in our everyday lives, but because commemoratives, in particular, were printed to be saved they live on in museums. By collecting something originally designed to be functional, stamp collectors influenced postal authorities who printed commemorative stamps and promoted the philatelic hobby. ¶ 6 Leave a comment on paragraph 6 0 By devoting space to studying collecting practices, I encourage others to look more seriously at collectors and collecting practices to gain a greater appreciation of the history work performed by them. Objects collected and saved by individuals often land in museum collections that be incorporated into exhibitions. Collectors have often been looked upon as quirky people obsessed with the minutiae of the things they collect. They are not always invited to share their expertise with museum staff, but this trend is changing. Some museums embrace collectors and other subject enthusiasts as valuable experts with specialized knowledge who can help interpret the material culture found in artifact rooms. Web platforms that facilitate sharing and co-creation of knowledge encourage historians and curators to invite others to share in the processes of saving and interpreting their own history, or to crowdsource descriptions of digitized objects and records posted online. If historians and museum professionals can see collectors as history workers with a history of their own, then this type of collaboration ushered in by the web may seem less radical.